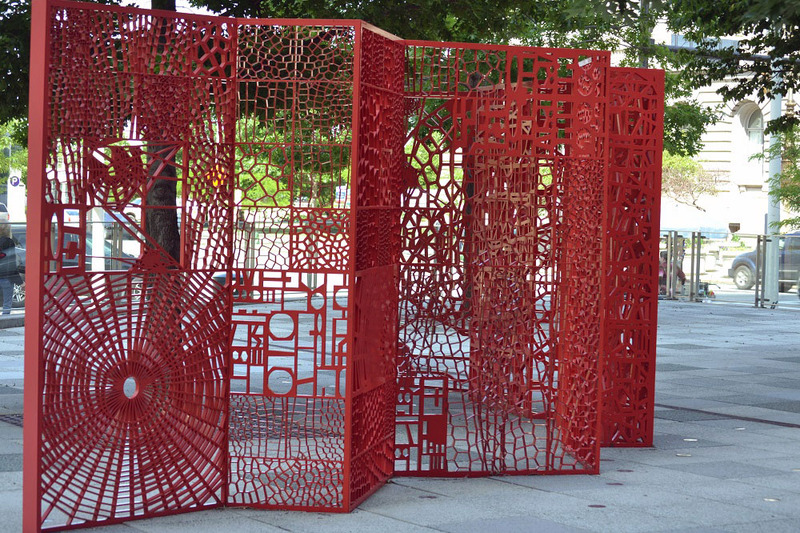 Known for sophisticated yet accessible work that blends art and design, Pae White was commissioned to create a permanent, site-specific artwork as part of the plaza renovation project for the Anthony J. Celebrezze Federal Building in Cleveland. This thirty-two-story skyscraper, built in 1967, projects a machine-like efficiency through its repeating composition of rectilinear forms and stainless-steel façade. While the architecture is austere, the site has always carried the promise of being a significant destination for public gatherings in downtown Cleveland. It features two plazas and is adjacent to City Hall, the Convention Center, and many businesses; however, the strong and persistent wind that blows through the site from Lake Erie precludes its use during much of the year. As part of a multistage renovation project, both plazas were redesigned to create a more hospitable environment for federal employees, visitors, and the people of Cleveland. Understanding the project’s intentions, White felt that her artwork should relate both to the building’s Modernist design and to the site’s environmental conditions, while also providing a point of destination in the vast plaza. The addition of many trees and other plantings to the plaza design prompted White to consider the history of garden pavilions and decorative trellises. She designed an eight-foot-tall, folded metal screen that is a patchwork of patterns based largely on the structures of dragonfly wings, which she chose for their elegant formal complexity and as a reference to the windy site. These dragonfly-wing patterns, which dominate one end of the charmingly titled Bugscreen, create an intricate maze of shapes that gives way to a quilt-like motif of boxes at the opposite end. These boxes hold patterns of pure abstraction as well as spider webs—a familiar motif in white’s work. 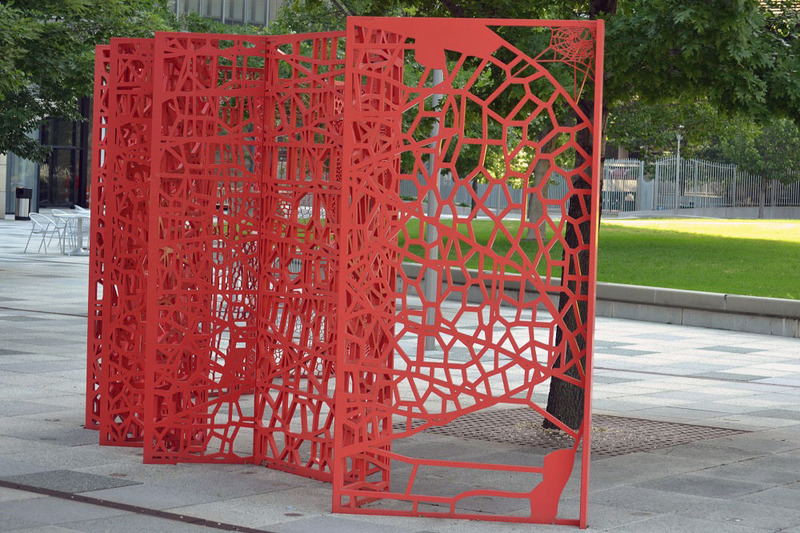 Painted bright red, Bugscreen engages in a visual dialogue with Free stamp (1991), an enormous red sculpture by Claes Oldenburg and Coosje van Bruggen that is located directly across Lakeside Avenue from the federal plaza. Set within a newly landscaped plaza and designed to encourage greater use of the site, Bugscreen helps to revitalize this important civic space. Bug Screen was commissioned as part of the Federal Govenment's Art in Architecture program. The Art in Architecture Program commissions the nation's leading artists to create permanent, site-specific works of art for newly built and substantially renovated federal properties across the country. These artworks enhance the civic nature of federal architecture and showcase the vibrancy of American visual arts. GSA reserves one-half of one percent of the estimated construction cost of each new federal building to commission project artists. 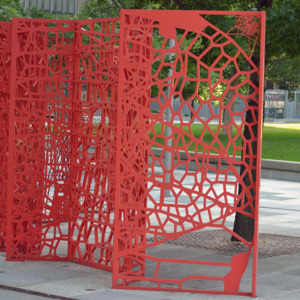 : Pae White, “Bugscreen,” Ohio Outdoor Sculpture Inventory, accessed April 22, 2019, http://oosi.sculpturecenter.org/items/show/1431.